This is a Kickstarter project. But it is a good news story, with the Floating Record vertical turntable by Gramavox far exceeding its funding needs already. No surprise there because this is a stunning piece of design and if you love your vinyl, a practical one too. 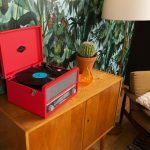 Gramavox has created a deck that’s all about showing off the vinyl, as well as offering a player with a wood base with built-in, full-range stereo speakers, an acrylic plinth and platter to keep the record in place securely, a rear control panel and a belt drive that spins the records at 33 or 45rpm. Just find a record, plug in and go. There’s a choice of maple or walnut for the base and plenty of additional outputs at the rear. If you pledge, you get in the queue to get one, The decks are scheduled to be shipped in December 2015 and the price is from $329. Shipping is to anywhere in the world.